Welcome to the Concept Smoke Systems website. Whether you need high temperature oil based smoke machines for hot fire training applications, or water based smoke generators for security, leak testing or air visualisation Concept Smoke can help you. Non toxic smoke, portable smoke systems, fixed smoke installations and design and build expertise all come as standard at Concept Smoke Systems. If you have a need for a smoke machine, aerosol generator, smoke generator or fog machine just talk to us! With almost 50 years’ of experience in the use of artificial smoke and a wide range of systems to choose from, we are in an unrivalled position to supply the equipment and advice best suited for your application. Smoke is the perfect medium for discovering where leaks are and how big they are! The correct functioning of HEPA filters is normally tested at the time of installation, as well as part of the routine maintenance programme. The majority of fire training centres and schools use gas to replicate the appearance and heat of a real fire but one thing gas doesn't produce is smoke! For many years, materials containing isocyanate have been the single biggest cause of occupational asthma in the UK. Vehicle paint sprayers are 80 times more likely to develop occupational asthma than workers in other industries. For producing a point source of smoke in a wind tunnel environment, Concept have the Aerotech smoke system, with a heated tip on the end of a thin wand. The air tightness or leakage rate of a building is the uncontrolled flow of air through holes, gaps and cracks in the fabric of a building, which may not be detectable simply by looking at the outside of the building. Making smoke in a very open environment or external environment can be a challenging! 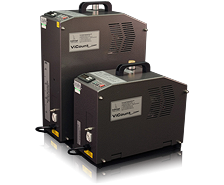 An oil-based smoke generator, such as a ViCount system, can produce dramatically more artificial smoke than multiple water based systems. Incredibly easy-to-use. Their off-power capability makes them portable, extremely versatile and ideal for confined space/evacuation training, flow visualisation, etc. The preferred system of major training centres worldwide. Producing a temperature resistant smoke ideal for hot training, hot smoke simulations & large scale testing, ViCount smoke is intrinsically biodegradable. Winner of "Fire Professionals Smoke Machine Comparison Test". Simple to use, continuously rated, and capable of filling large volumes, if required. Small, light-weight and battery powered. The Air Trace is great for applications where only a minimal amount of smoke is required such as air tracing. More powerful than the Air Trace. This compact yet robust smoke generator is particularly helpful if you want to "top up" smoke produced from a conventional system on an ad-hoc basis. When no outside venting is feasible, smoke scrubbers can remove Concept smoke from the air. A useful range of accessories for smoke applications, including a professional fire simulation box, a smoke density measurement module, CO² detector & and smoke detector test aerosols. "Concept offer a fantastic after sales service whether it be maintenance courses or queries - fully satisfied. With my experience of dealing with Concept I find it difficult to see where improvements can be made as I feel 100% satisfied with the product, information and answers to any queries. I feel that it gives a more realistic setting for difficult exercises, which improves the experience and motivation of students / crews. The only other way would be to use obstruction masks that take the realism out of any training. I would like to add, having worked with Concept over the last 18months I have found it educational and the staff are a credit to the company. I would like to thank all the staff for the patience they have shown with dealing with my queries."